When we think of February, the thought of Valentine’s Day may come to mind. But did you know that February is also Library Lovers’ Month? In honor, we are hosting our heart-coloring contest. Stop by the Allied Gardens Benjamin Branch Library and pick up your copy. We’ll proudly display your creations and award prizes for each age category. Contest ends on Feb. 28. And don’t forget to tell us why you love your library! Did you know that the entire month of February is San Diego Museum Month? 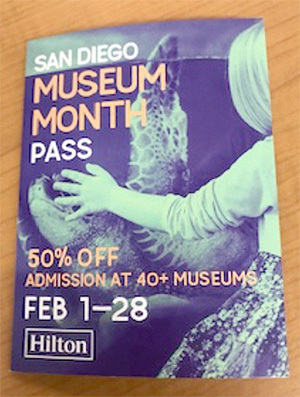 All library locations are stocked with special discount cards to 40-plus museums in San Diego County. Each card will get you 50 percent off admission for up to four people. What a great deal and fantastic way to experience the many museums in our community. Stop by the front desk and pick up yours. How many can you visit this month? Believe it or not, it’s time to start thinking about your taxes. For some, the thought of preparing your own taxes can be a daunting task. If you need assistance, we are hosting the AARP Free Tax Preparation Clinic from Feb. 4 through April 8. This free tax assistance gives special attentions to taxpayers over the age of 50 but is also open to taxpayers of all ages with low and moderate incomes. AARP tax volunteers will be here Mondays from 9:30 a.m.–4 p.m., Fridays from 12:30–5 p.m., and Saturday, March 30 from 9:30 a.m.–4 p.m. Please note: There will be no tax assistance on Feb. 18, Feb. 22, March 22 or April 1. Keep in mind that this service is available on a walk-in basis only with no appointments. Our first book sale of the year is on Saturday, Feb. 23, from 9:30 a.m. to 1:30 p.m. If you’re looking for books at bargain basement prices, then look no more. Our book sales are immensely popular and all proceeds help to pay for various library programming such as Yoga Storytime and Mindfulness & Meditation. Are you interested in hearing more information about strokes such as causes and symptoms? If so, keep an eye out for a special program in early March where you can hear from an expert and have your questions answered. There will even be free blood pressure checking. Here at the branch we would like to extend a huge thank you to our community for your donations benefiting the Zephyr housing complex for homeless veterans. All these donations say “Welcome Home” to our veterans and will help to provide the essentials for setting up a new apartment. This month, our glass display cases are housing a new and unique collection by patron Tony Harmon. Tony’s collection shows items from the Moulin Rouge Hotel and Casino, which opened in May 1955 in Las Vegas. This hotel quickly rose in popularity as Las Vegas’ first racially-integrated hotel and casino where many African-American A-list singers and musicians performed on a regular basis. Items on display include poker chips, ashtray, Champagne glasses and even red lightbulbs from the flashing street sign. You won’t want to miss seeing this slice of history. All city libraries will be closed on Monday, Feb. 18, in honor of Presidents Day. —Kathryn Johnson is managing librarian of the Allied Gardens Benjamin Branch Library.